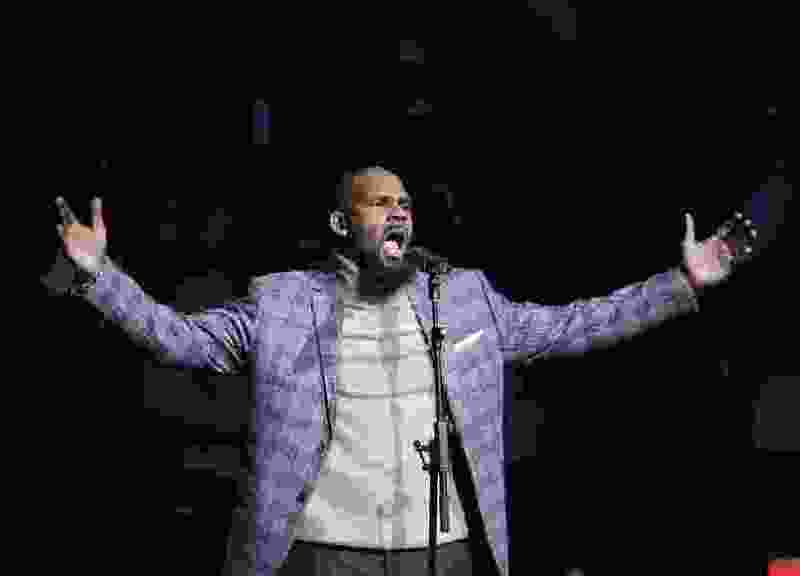 (Frank Franklin II | AP file photo) In this Nov. 17, 2015, file photo, musical artist R. Kelly performs the national anthem before an NBA basketball game between the Brooklyn Nets and the Atlanta Hawks in New York. For Grammy-nominated singer Joe, singing the hit song R. Kelly wrote and produced for him is out of the question. “I’ve stopped performing the song,” he said in a statement to The Associated Press, referring to “More & More,” a Top 20 R&B success released in 2003. “No music or intellectual property is worth being inconsiderate to the feelings or pain of others,” 45-year-old Joe continued. New York • For Grammy-nominated singer Joe, singing the hit song R. Kelly wrote and produced for him is out of the question. In the wake of multiple sexual abuse allegations against R. Kelly — which intensified this month with the release of the Lifetime documentary series “Surviving R. Kelly” — some performers are denouncing songs the R&B hitmaker created for them. Jennifer Hudson on Thursday removed two songs R. Kelly wrote for her from some streaming platforms, including YouTube and Apple Music: the Grammy-nominated “It’s Your World” and “Where You At,” a Top 10 R&B hit. Lady Gaga apologized for her 2013 duet with R. Kelly, “Do What U Want,” and removed the track from streaming services. Céline Dion followed Gaga’s footsteps, removing her Grammy-nominated duet with the embattled singer, titled “I’m Your Angel,” from streaming platforms. And B2K, the boy band whose only song to top the Billboard Hot 100 chart was the R. Kelly-produced “Bump, Bump, Bump,” said after their reunion tour, which kicks off in March, they will no longer perform that song or the others R. Kelly crafted for them. Several artists, through their representatives, didn’t return multiple emailed requests from the Associated Press asking if they would continue to perform songs R. Kelly wrote for them, including Maxwell. A rep for Kelly Price, with whom R. Kelly has worked, declined to comment. “Based on my biblical studies, I have always been an advocate that the message of the Gospel of Jesus Christ is bigger than the messenger. This is a guiding principle for me. When I was recording my most recent album, I was presented with the song ‘Listen,’ written and produced by R. Kelly,” he said. He continued: “It struck me immediately as a song with a powerful message that needed to be heard, and as a song that I needed to record. With the recent airing of the ‘Surviving R. Kelly’ docuseries (which I have not seen), the world is chiming in and taking sides. My sentiment remains the same: I am not called to cast stones or pass judgment on anyone involved. My responsibility, and my heart, is to pray — for everyone involved,” he said. R&B star Fantasia, whose 2016 song “Sleeping with the One I Love” came from R. Kelly, echoed some of Sapp’s thoughts. AP Entertainment Producer Marcela Isaza contributed to this report.